Plotter Epson Stylus Pro 3880 with CISS - Inksystem - save money on ink! Buy Plotter Epson Stylus Pro 3880 with CISS and make 30 times more quality prints for the same money! Pay only 0.04 USD for A-4 full color print! 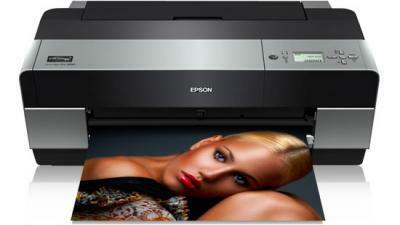 Epson pro 3880 is a qualitative device with a possibility of direct photo printing from the working station. Due to the construction, it provides you with handy operation process and qualitative printing. It has the same characteristics, which a lot of users could appraise in the similar models in this class epson stylus pro 4450 and epson stylus pro 4880. Stylus pro 3880 uses printing system, which consists of nine separate cartridges. They are located on the front panel of the device. It is very convenient, because you don't have to lift the upper cover of the printer. This construction provides easy and handy operation and even an amateur user can change consumables without any troubles. 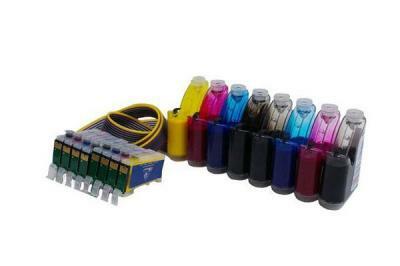 The ink system with nine separate ink reservoirs provides smooth gradient and a wide range of color tints and shades. The printing resolution of the device is 2880x1440 dpi. Epson stylus pro 3880 is an inkjet printer, which belongs to a new generation. It has extended amount of characteristics, including printing of such format as A2. It will be a good assistant at home as well as in office. You could accomplish all the important printing tasks with the help of this device. Moreover, it will not occupy a lot of working space. All the necessary functions were combined in stylus pro 3880. And the main its advantage is that it works very quickly, has compact dimensions and wide range of functions. The latest black ink technology was applied in the epson 3880 in question. It is DURABrite Ultra Ink. It provides high level of printing both on office paper and photo paper. And if you use Claria Color ink, you will get quality images, due to the reproduction technology and color management system, which was used for better color rendering. Epson stylus 3880 pro allows you to choose cartridges of standard capacity or ink reservoirs of extended capacity. The construction of the device includes an independent ink cartridges form Epson. They have an extended capacity. Due to it you can make savings and your prints will cost as if you make them in laser printer. A vertical tray is used for automatic paper feeding. The receiving tray looks like a telescopic platform with a stacking stop, it is meant for printed documents. Another one advantage of the device is a quick start, it can run without pre-heating. It will take several seconds to prepare it for operation. The case of this photo printing device epson 3880 is accomplished in black matt plastic. The design is classic. It has glossy upper cover, which flows into the front cant and provides easy access to ink reservoirs and printing head. The glossy surface of the device can be easily soiled, that is why you should use it carefully and clean, if you want your printer looks effective. The minimal volume of ink droplets is 3.5 picolitres. Its thickness is about 0.35 of human hair. This particularity eliminated the necessity of usage any additional bright ink for reproduction of tone gradation. Recently, Ultra Chrome ink was used only in devices of EPSON Stylus Pro series. Plotter epson stylus pro 3880 is a large-format printing devices. But now its advantages are obvious due to the wider color gamut RGB and you can meet it more frequently. A2, US C, A3+/Super A3, A3, 12x12", US B, B4, Legal 8½x14", Letter 8½x11", A4, B5, A5, Half letter, A6, 11x14", 20x25 cm (8x10"), 11x17", 13x18 cm (5x7"), 10x15 cm (4x6"), 16:9 wide size, 9x13 cm (3.5x5"), user-defined length up to 37.4"